Of The Prince In Daniel 9:26? This is a much misunderstood portion of Scripture. Many relate it to a future prince and the people of the prince coming up with all sorts of interesting ideas. But what is this verse really talking about? To begin, let's look at the verse in question. "Then after sixty-two weeks the Messiah will be cut off and have nothing, and the people of the prince who is to come will destroy the city and the sanctuary. And its end will come with a flood; even to the end there will be war; desolations are determined [NAS]. In order to discover who this prince is [and therefore who the people of the prince are], we will have to gather clues from the context. If we know what time these things will happen then we can search for a qualifying 'prince'. The surrounding verses hold many clues; however, a major clue is found right here in verse 26. We are told that "the Messiah will be cut off" shortly before the "people of the prince" come. To what is this key phrase referring? Let's start with being "cut off". Being cut off means a total separation even to the point of killing someone. For example, in Jeremiah 11:19 Jeremiah prays to God because people want to "cut him off from the land of the living" [NAS]. In other words, someone was plotting his murder. In Psalm 37:9 it says, "For evildoers will be cut off, but those who wait for the Lord, they will inherit the land [NAS]. Again, being cut off speaks of total destruction. We know Jesus is the Messiah, so when was Jesus cut off or killed? "By oppression and judgment He [Jesus] was taken away; and as for His generation, who considered that He was cut off out of the land of the living, for the transgression of my people to whom the stroke was due? [Is. 53:8, NAS]. Jesus died for our sins about 2,000 years ago. He was cut off for us. Isaiah leaves no doubt as to what he was referring to. Therefore, the Messiah being cut off in Daniel 9 must refer to the death of Jesus on the cross. If we say that Jesus is going to be cut off or killed again in the future we contradict the plain teaching of Scripture. "...knowing that Christ, having been raised from the dead, is never to die again; death no longer is master of Him [Rom. 6:9, NAS]. 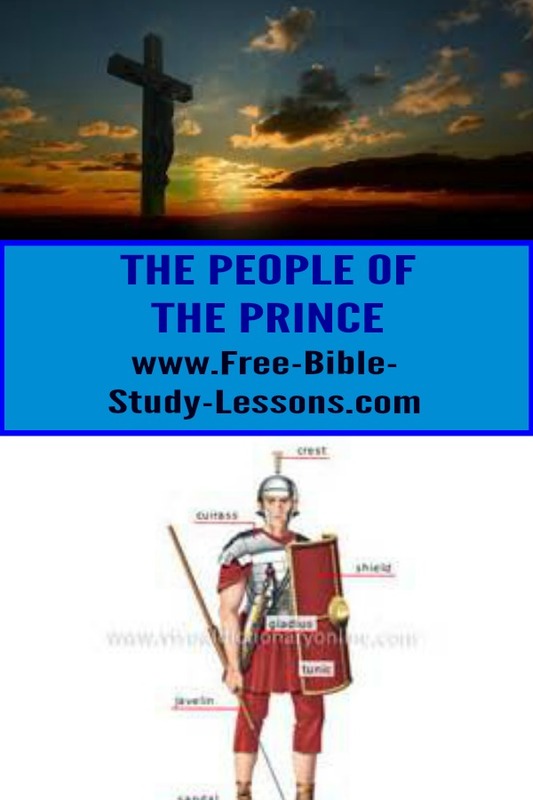 Since the "people of the prince" come shortly after the crucifixion, we must look in that time frame to discover who they were and who the prince was. What will the "people of the prince" do? They "will destroy the city [Jerusalem] and the sanctuary". Jesus died about AD 30. Was Jerusalem and the temple destroyed shortly thereafter? And if so, by whom? The Jewish Revolt broke out in the reign of Nero who sent his Roman armies to crush it. The horrors of that war almost defy description, but in the end Jerusalem was razed to the ground and the temple was destroyed. The "people of the prince", who came to destroy Jerusalem and the temple, then must be the Roman armies. That leaves us with two possible choices for the prince. Nero, the emperor who sent the Roman armies to Israel or Vespasian, the emperor at the time when Jerusalem and the temple were destroyed. In the context of Scripture either of these world rulers would fit the description. The understanding of this verse is the same no matter which one you think is the most likely prince. The people of the prince are the armies under Nero or Vespasian's command. Since the next verse [Dan. 9:27] is often misunderstood in relation with the prince, let's take a brief look at it as well. "And he shall confirm the covenant with many for one week: and in the midst of the week he shall cause the sacrifice and the oblation [grain offering] to cease, and for the over spreading of abominations he shall make it desolate, even until the consummation, and that determined shall be poured upon the desolate." [KJV]. The verse is confusing because it talks about "he". If we are going to understand this verse we have to know to whom "he" is referring. In verse 26 there are 2 "hes" - the Messiah and the prince. Which one does the "he" of verse 27 talk about? Those who place the prince in the future [which I hope I have shown is incorrect], automatically assume "he" refers to the prince. However, since we have established the time fame of these verse around AD30 [crucifixion] to AD70 [destruction of Jerusalem] we have to ask two leading questions: In this time frame, who made a covenant? and Who caused the sacrifice and the grain offering to stop in the middle of the week? The answer to the first question is: Jesus the Messiah. He established the New Covenant at this time - the greatest covenant of them all! "And for this reason He [Jesus] is the mediator of a new covenant...we have confidence to enter the holy place by the blood of Jesus, by a new and living way which He inaugurated for us through the veil, that is, His flesh" [Heb. 9:15; 10:19-20, NAS]. Jesus confirmed this covenant with many during His earthly ministry. As far as God was concerned, when Jesus died and rose from the dead there was no more need for animal sacrifices. "...and not through the blood of goats and calves, but through His own blood, He entered the Holy Place once for all, having obtained eternal redemption" [Heb. 9:12, NAS]. So Jesus did cause the sacrifice and the grain offering to stop. After He had paid the full price for sin, they were not needed any more. The Jews may have kept offering the sacrifices until AD70, but as far as God was concerned they were useless. They stopped having purpose when Christ rose from the dead. This section of Scripture also uses the word "week" to symbolically portray 7 years, each day of the week representing 1 year. Half of 7 years is 3 1/2 years. Verse 27 says that "in the midst of the week he shall cause the sacrifice and the oblation to cease". Jesus began confirming the covenant at the beginning of His ministry. However, in the midst of week [and 3 1/2 years of ministry] He was cut off by being killed and in so giving His life He caused the sacrifice to end. One other point: In verse 26 the Messiah is the subject of the sentence. Grammatically the "he" of verse 27 should refer to the subject of the sentence, which indeed it does. When we consider all this, Jesus the Messiah must be the Person "he" is talking about in verse 27. It also says that "he shall make it desolate". The people of the prince [the Roman armies] were the instruments of judgment in the hand of Jesus. So Jesus was the One who made Israel desolate for their rejection of Him as Messiah. Those who make the "he" of verse 27 refer to the prince or the supposed antichrist have take the holy, beautiful work of redemption won by Jesus with His life's blood and declared it to be a work of the enemy.